Hatters midfielder Alan McCormack labelled it a ‘great decision’ to appoint interim boss Mick Harford as manager until the end of the season this week. The club legend, who is now in his second spell at the helm, had been head of recruitment prior to taking charge once Nathan Jones left for Stoke City. Since moving up to the hot-seat, Harford has made a wonderful impact, leading Luton to the League One summit, taking 16 points from a possible 18 with five straight wins. McCormack, at 35, one of the most senior members of the squad, with over 450 games to his name, said: “I think it’s a great decision and he’s been incredible with the players from the moment I’ve come here. “He’s in every day, he’s literally in every single day. "He used to love coming in with the boys, telling us stories about when he played, games he was at at the weekend, games he was going to watch the next weekend. “The boys had so much respect for him, so when he took over, it was just a natural thing for him to come in. “He knew how we were, knew our personalities, what we liked to do as individuals, what we do as a group, training too. “He came in every day and watched training, so he knew the structure, he knew the style of play we have and when he took it on, he didn’t make any changes whatsoever. “He wanted it to be the same, how we set up Monday to Friday in training and continued that. 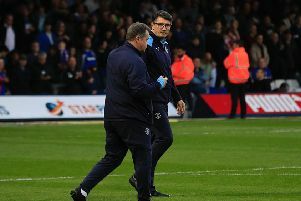 McCormack was also quick to praise how chief executive Gary Sweet had handled the past few weeks, with speculation surrounding who might take over coming in the middle of the transfer window, plus the club's attention on their Power Court and Newlands Park proposals. He added: “Gary is very open and he came in with some of the board members once a week to tell us, this is the situation. "So it just stops players losing focus on the actual three o’clock on the Saturday afternoon."